Stop. Don’t call every lawyer in the phone book. Don’t call ANYONE yet. If you’re charged with misdemeanor reckless driving, do yourself a favor and learn about the case FIRST. 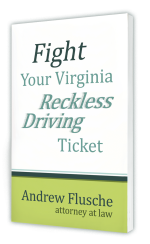 Reckless driving in Virginia is a class 1 misdemeanor crime. Yes, you’re charged with a crime that’s on the same level as DUI, carrying a concealed weapon, and assault. It’s not just a traffic ticket. But it’s NOT an offense where you’re definitely going to jail. The punishment can include up to one year of jail, but receiving any jail time is rare. While it’s a serious offense, don’t believe scare tactics by desperate attorneys. That’s chapter 3 of my book! You’ll learn all about the possible defenses that may work for your case. And chapter 4 covers the next critical question: what defenses don’t work? Here’s the complete table of contents. As you can see, this isn’t a 4-page pamphlet that I’m calling a book. It’s a 78-page book that sells on Amazon, but you can download it for free right here. That’s right. I’m a traffic lawyer, and I’m telling you that you might NOT need to hire a lawyer. But until you learn about the charge, defenses, and the court procedures, you won’t have a full picture of what you should do. That’s where my free book comes in. Download your copy below to start your defense. What county or city is your ticket pending in? Your information is 100% secure and confidential. I won't sell it, share it, or spam you. "This book was very informative and an interesting read. I hope you like it as much as I have. It helped me understand what I had gotten myself into." "...I would highly recommend this book to you regardless of whether you choose to hire a lawyer or represent myself. I think I would highly recommend the book to anyone facing reckless driving charges." "Andrew ... listened to my issues and has excellent communication skills. He responded to all my questions and inquiries in a timely manner." "I received thorough and informative literature from Mr. Flusche's office, and that's how I found out that speeding isn't a joke in Virginia." I'm Andrew Flusche. I limit my law practice to defending people like you who are facing a traffic or misdemeanor charge. The majority of my cases are reckless driving misdemeanor tickets where I defend people from all walks of life. I've fought hundreds of reckless driving cases. I hope you find my book useful as you begin your defense!